Bagworms can be frustrating for homeowners. The following information should prove helpful. Larvae feed on the foliage of many species of trees and shrubs, often causing serious damage to woody ornamentals and shade and landscape trees. The larvae or caterpillars construct a characteristic case or bag that they carry around with them, hence the name "bagworm." The cases or bags are composed of silk and portions of leaves and twigs from the plant on which they feed. arborvitae, juniper, cedar, cypress, pine, spruce, black locust, honey locust, maple, boxelder, willow, elm, sycamore, apple, basswood, wild cherry, and various oaks. 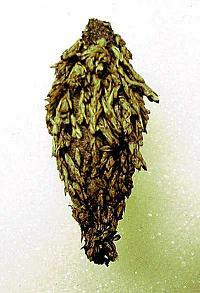 Bagworm infestations on smaller trees and shrubs can be controlled by removing bags before the eggs begin to hatch. Destroy the bags by crushing, immersing in soapy water orburning. If bags containing larvae are simply discarded on the ground, the larvae may return to the tree or any nearby plant. For most effective chemical control and prevention of damage to trees and shrubs, apply sprays from early to mid-June. Because of the 3 or 4 week hatching period, two spray applications, two weeks apart, may be warranted for maximum control of heavy infestations. Wettable powders are less likely to cause injury to host plants than liquid formulations. Do not use oils or soap products on blue colored foliage plants (blue spruce, etc. ), It causes the plant to lose its blue color. New growth will come back in blue. Use all insecticides with caution to avoid injury to bees, animals or excessive exposure to humans. Always read, understand and follow label directions. Remember that the label is the law. Use the product according to label directions and dispose of empty containers as directed by the label. Labels change rapidly, so re-read with each new purchase.